Making your own bubble solution is quick, easy, and fun to do with the kids. This recipe for bubble solution is perfect for making giant bubbles! It has quickly become one of our favorite go-to outdoor activities to enjoy together on beautiful Spring and Summer days. Tip – for best results, make bubbles on a humid day with little or no breeze. Bubble Wands — see this tutorial to make giant bubble wands. 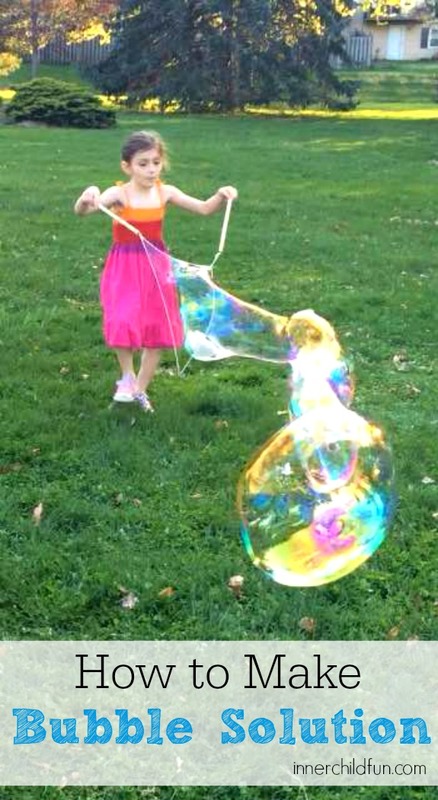 My kids can spend an entire afternoon making these giant bubbles! Older kids can help measure out the ingredients to make the bubble solution or gently stir the mixture once all of the ingredients are combined. Such a great classic Summer fun activity for kids (or the kid-in-you! ).